Who wouldn't want to run their own criminal empire? I'm sure some of you out there had a Scarface poster on your wall at some point in time. Well, in Bulletproof, you are placed at the head of a crime organization. It's up to you, then, to build it into a real powerhouse empire. Collect the right goods and you're on your way to becoming the top dog. The game is up on Kickstarter now. Bulletproof is a game for 2-5 players that blends tactics, strategy and luck as players compete to build criminal empires and can be played in under 30 minutes. Bulletproof takes place in a world much like our own, acceptably corrupt and full of opportunities for people willing to ignore the law. Every character is a criminal who uses corruption, bribes and many other secret weapons to interfere with other players, acquire territories, put money in their safe and build their criminal empires. The primary mechanism in Bulletproof is set collection. In Bulletproof set collection is the only path to victory. However it also serves an important purpose as each territory card has a unique bonus which players can activate to gain advantages. Activating certain sets as opposed to others in conjunction with different action cards allows players to create interesting and powerful combos. In addition to set collection the game also uses hand management and variable player powers to create a very fun and strategic game with high replayability. 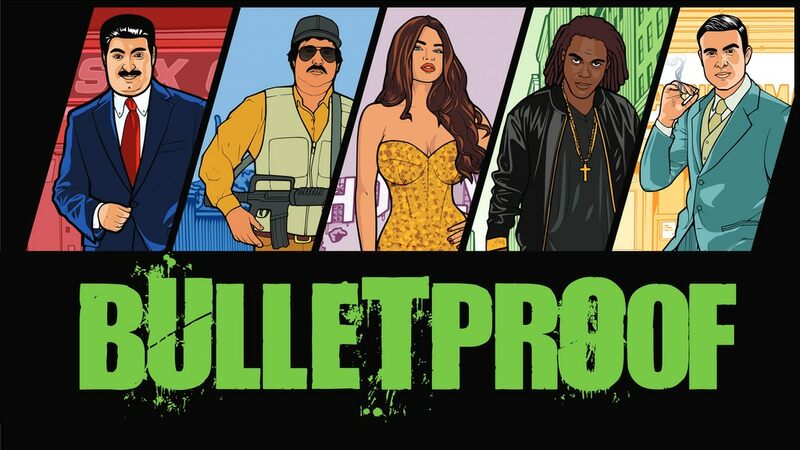 Bulletproof was designed by Anahi and Rob Radke, cofounders of Double Eagle Games, based in Atlanta, GA. The game was illustrated by Natasha Khurs, Anahi Radke was responsible for the game's graphic design and the video was produced by Chris Zhang.